By Michael Lukaczyn About thirty years ago on my birthday, my father gave me a Metaframe aquarium with a pair of seahorses that he had bred. They were beautiful and I would stare at them for hours on end. He made sure I understood the important responsibilities that were required to keep them and some of the guidelines I would need to follow in order for them to thrive in my aquarium. I took these lessons seriously, and they still guide me today as I endeavor to expand the limits of my husbandry skills. There are so many beautiful creatures available in our hobby today, but nothing takes my breath away more than the feather stars of the crinoid family. Whether they are perched out on a Gorgonian showing off their feathery arms, swimming or walking across the reef, these echinoderms had me star struck at first sight. I started researching information on crinoids and tried to find out as much as I could before I purchased one. When it came to keeping them in aquariums, there was little information to be found. Success stories are even less available. As a determined aquarist, my goal was to be able to keep them in captivity and so, I set out to develop my own guidelines for successful crinoid husbandry. I must caution you that this journey has been a complex and time consuming one, and I don’t recommend this path for all but the most dedicated of hobbyists. Armed with at least some information, I tried in vain to find someone that actually sold feather stars. Searching local fish stores in my area, no crinoids were to be found. Each shop told me the same story: “They ship horribly” and “you can’t keep them alive for any length of time in your aquarium”. After much persistence, I finally found one shopkeeper who agreed to order some for me. He charged me slightly over his cost, but I had to buy whatever was brought in and I had to pick them up as soon as they arrived—the crinoids would not touch his system and he would assume no responsibility once they were in my hands. Essentially, he had nothing to lose by indulging me. When the first shipment arrived, I excitedly brought the feather stars home and started to slowly drip acclimate them. There were immediate losses from shipping and further losses within the first 48 hours. What would happen is the crinoids would start dropping arms and then completely fall apart. At that point, I started to understand why the local shops do not bring them in, and the scope of the challenge I was in for. Disheartened perhaps, but I wasn’t discouraged as I still had three surviving feather stars, so my journey continued. 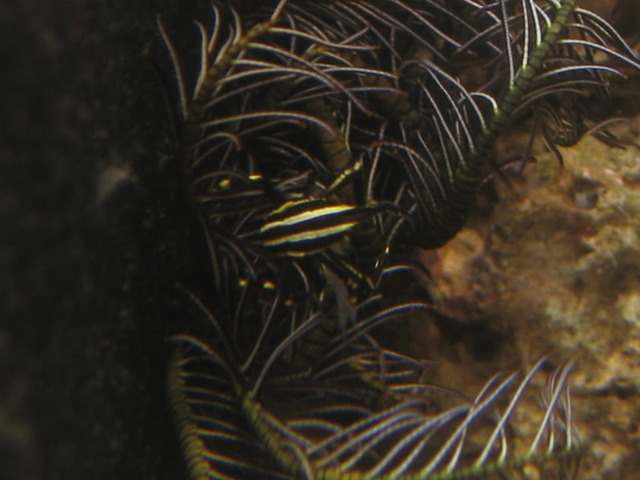 I was able to capture my crinoids (feather starfish) walking across the bottom of my aquarium this morning. The blue coral it is walking over is a Distichopora or otherwise known as a lace coral. Didn’t have a chance to clean the glass but I thought it was more important to document them walking. A key factor in crinoid survivability is ensuring they go directly into a very stable aquarium. Crinoids do not take kindly to unstable parameters. They require pristine water quality— a fact you need to actively work at given the heavy food demands of these animals. I believe in heavy skimming and large water changes to help control nutrients. Currently, I change a minimum of 25% of my aquarium’s volume every Wednesday and Saturday using the ESV B-Ionic Seawater System as my salt of choice. Specific Gravity is maintained between 1.0225-1.026. I mix the total amount of water I am planning to change, and then perform slow, small water changes, changing one gallon at a time. Although this is rather tedious, it works well and doesn’t shift the aquariums parameters around too rapidly. Crinoids are also very sensitive to shifts in temperature and adequate cooling and heating systems are a must. Do your best to keep the tank temperature below 76 degrees. I target 73-74 degrees in my system. Feather star holding onto a Gorgonian via use of it’s cirri. Water flow and appropriate current patterns are also essential for maintaining suspension -feeding organisms like crinoids. When crinoids feed, they form a filtration fan with their arms to catch their food. The shape of the fan varies depending on the species and the type of current in the aquarium. 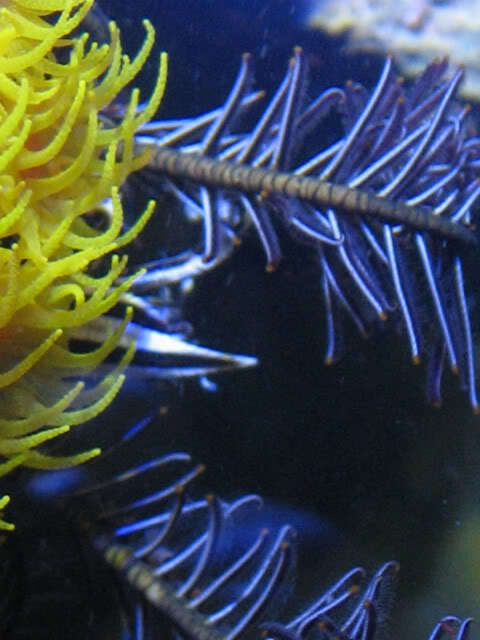 Feather stars will move throughout the aquarium until they find their preferred feeding spot. Keep in mind just as different species form different filtration fans, they also have different feeding behaviors and likely favor different prey items. Some species will hide all day, only exposing a few arms and then fully emerge at night. Others tend to be exposed all day long on the reef. Crinoid after gorging on Cyclopeeze A) arm food groove B) Pinnule C) **** D) arm. and at 7pm Reef Nutrition Shellfish Diet is dosed manually. 4) Daily at 6pm—frozen Piscine Energetics or Hikari mysis shrimp is defrosted in aquarium water and fed manually 5) Daily at 8pm—frozen Argent Cyclop-eeze is defrosted in aquarium water and fed manually 6) Feather stars seem to love Ultra min F! I frequently mix in 1/2 cup of aquarium water: a 1/8th of a teaspoon of Ultra Min F, frozen Argent Cyclop-eeze, 1ml of Reef Nutrition OysterFeast. Then I dose the feather stars directly using a Kent Sea Squirt. 7) Daily— Lightly stir sections of the gravel in my aquarium allowing detritus into the water column 8) Daily—A bag of Fauna Marin Ultralith stones are located in the last chamber of the sump (I use them now instead of bio balls) the bag is shaken and I let the detritus flow into the main display. Fauna Marin Ultra Bio and Ultra Bak are dosed manually to the sump above the Ultralith stones. Acquisition and Acclimation To this day, feather stars are difficult to find in most aquarium shops. You may want to ask your local fish store to order them or you can search on-line. If you are looking to purchase them by mail order, try to avoid prime summer time purchases of crinoids since even with the aid of cold packs, they do not do well. The acclimation of a feather star to your aquarium takes a little longer than you might think. 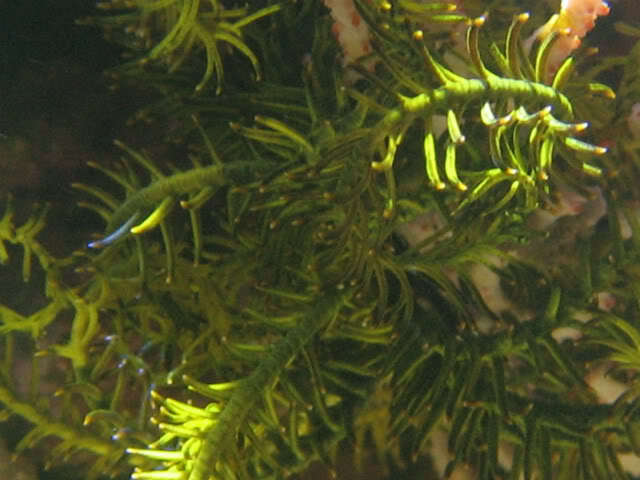 I normally drip acclimate feather stars between 3-4 hours before placing them in the aquarium. During the acclimation process, should they drop an arm or two, don’t be alarmed because they will grow back. 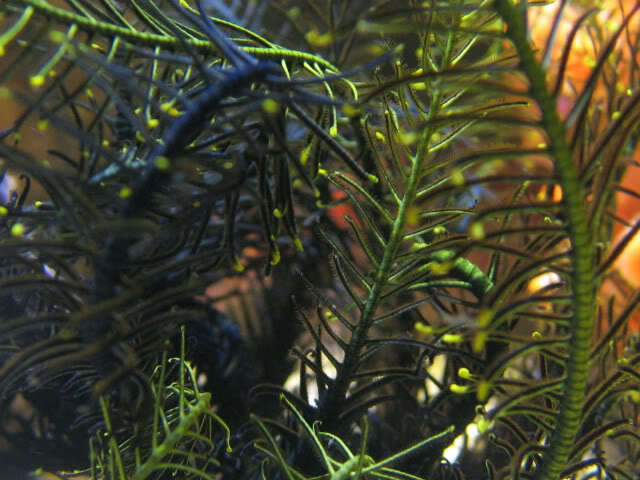 This also hold true while they are in the aquarium – feather stars will drop arms on a regular basis. Commensalism Commensal squat lobsters can be found as hitch hikers with crinoids. They live within the arms of the crinoids and enjoy stealing minimal amounts of food from them without harming the crinoid. Two of the more common crinoid hitchhikers are Galathea inflata and Allogalathea elegans. 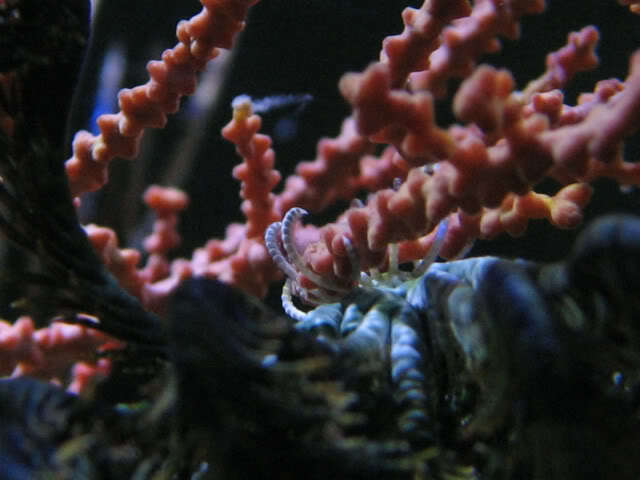 They are also available separately in the aquarium trade, so if you have a feather star and are interested in purchasing a squat lobster you can do so. 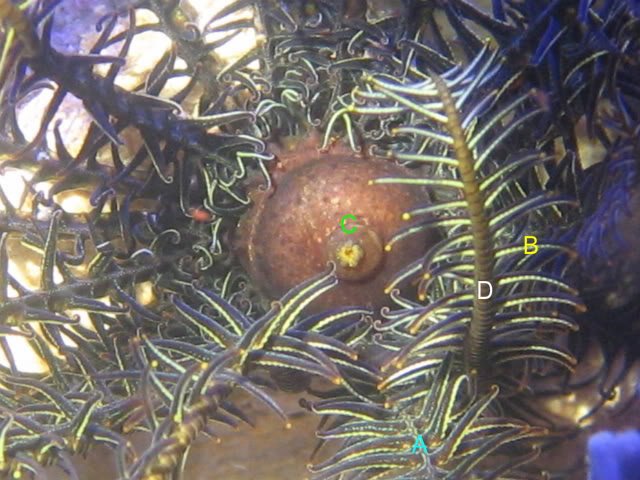 Crinoid with a commensal squat lobster (Galathea inflata). Crinoid with a commensal squat lobster (Allogalathea elegans).